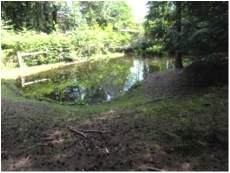 The lower off-channel pond had been previously constructed by Dale and Brenda Wilson on their private property adjacent to Nash Creek (Photo 1; Figure 1). Figure 1. Location map of off-channel works on Wilson property adjacent to Nash Creek. The pond was developed in part for stock watering and also as a rearing pond for Coastal Cutthroat Trout (Oncorhynchus clarkii) and Coho (O. kisutch). Water levels in the pond are maintained perennially by a groundwater seepage channel that originates from the west side of the pond. 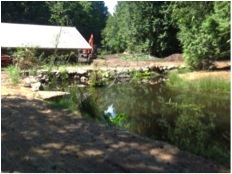 The lower pond had in-filled with sediments and was in need of re-excavation. Also, fish access between Nash Creek and the pond was impeded by the existing connector channel and needed to be rehabilitated (Photo 2). 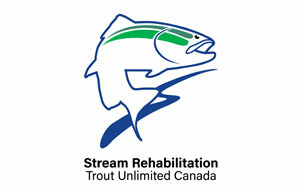 LGL Limited, with support from NCES and TUC (Trout Unlimited Canada), coordinated and managed the delivery of the overall project. LGL prepared the rehabilitation design for the connector channel and off-channel ponds, and supervised construction of the 2015 works. Photo 2. Looking north at existing lower connector channel between pond and Nash Creek, 18 June 2014. Rehabilitation work on the project occurred in two phases. In October 2014, the landowner, D. Wilson, deepened the existing lower pond and constructed a new upper pond using an Hitachi EX220 track excavator (Photo 3). The landowner also rerouted the groundwater seepage channel that originally entered the lower pond into the upper pond. 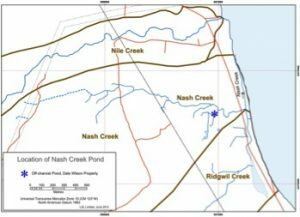 Pond depths after construction averaged ~1.5-2.0 m with localized maximum depths of >2.2 m in several pockets of the ponds. Photo 3. 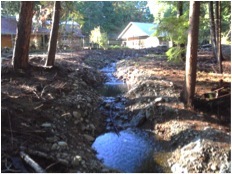 Looking southward after deepening, widening and armouring of lower off-channel pond. In July 2015, a local contractor, Taschuk Excavating Ltd., undertook construction using a John Deere 160C LC track excavator. Tandem axle dump trucks delivered rock and gravel to the site. Work encompassed four days between 15 and 18 July 2015. Activities included re-construction of the connector channel with rock riffles and pools, armouring the east bank of the lower pond, and lining the groundwater channel entering the upper pond with gravel and cobble. Photo 4. Looking upstream in connector channel after riffle-pool construction. 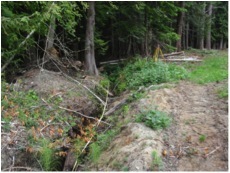 Ten riffle structures were constructed in the connector channel that created a stepped water surface profile to facilitate fish access between Nash Creek and the lower pond (Photo 4).